Tssssssss. That is the sound of sizzling. There are steaks, hot dogs, burgers, chicken, veggies- all cooking on the grill. You are at a party with friends and getting ready to eat. Who do you see grilling when you think of that party? Is it you? Your dad? Your mom? Husband? Wife? Grilling food has become a staple of American food culture. With eight out of ten American adults grilling per year (Galosich 2006), the backyard barbecue and celebrations such as grilling on the Fourth of July have become associated with a true American food experience. Historically in America, men have been the head of the household, and also the primary grillers of the family. Our research objective is to explore if gender continues to play a prominent role in grilling today. To accomplish this, we are looking to evaluate the modern gender roles of grilling in suburban America. Through a survey and interviews we are looking to explore the reasons for families’ grilling practices and why certain members of the family enjoy grilling. We also would like to explore how grilling is viewed in American culture with respect to gender through advertisements and promotions in the grilling industry. With this data, we will be able to evaluate our hypothesis that men continue to be the prominent grill cooks within American households, specifically those in mid Michigan. First, we performed a literature review to understand the historical context of our study. We analyzed journal articles on grilling and gender roles in food preparation in America. Next, we created a standardized survey to estimate what percentage of women and men were the predominant grillers in their household for our sample. Our sample surveyed consisted of 47 individuals from the mid Michigan area. From the response of the survey, we chose people to interview about their thoughts on the culture of grilling in America. We intended to interview a male and female who were the predominant griller of their household and a male and female who were not the predominant griller. While men who were not the predominant griller in their households responded to our survey, none of them were willing to further participate in our study. Thus, we chose to interview a both a man and a women who predominantly grilled and two women who did not predominantly grill. We selected two interviewees as women who did not predominantly grill because this group yielded the largest amount of responses to our survey. Then, we used participant observation to study the behavior and practices of a key informant, Robert, in the grilling methods of his family. Finally, we analyzed advertisements and commercials about grills from 1974 to present to see how grilling is shown and perceived in a social setting. Before analyzing the results of our study, it is important to first examine our position in our study. We all come from Midwestern families that live in a suburban area and are accustomed to grilling within our families. Also, males are the predominant grillers in each of our families. The key informants of this study include our friends and family members. America post-World War II saw a tremendous growth in population with the baby boom, and as a result, middle-class Americans moved their families into suburban neighborhoods. However, the effect of the population being distributed close together in suburbs lead to the reduction in size of the average American home. To combat this trend, many Americans found a new purpose for the area immediately outside their homes: patios to be used for grilling. The grill became a place of social gathering in the 1950s, where men were the ones primarily cooking the meat outside while women were in the kitchen make side dishes and desserts (Miller 2010). Societally, the majority of women were expected to be housewives, and thus were expected to carry out household duties “from cleaning bathrooms and preparing food, to caring for the children” (Duffy 2007). However, grilling was an exception to this rule; it was not viewed as men taking on the duties of a housewife when they were barbecuing though. Instead, they “were claiming their natural role as meat consumers” (Neuhaus 1999). The women of the time were expected to assume all cooking duties, but the masculine act of grilling was reserved only for the men. It was not viewed as safe for the women, likely dating back to primal views that men hunted and were the individuals who cooked meat over the fire (Sobal 2005). Even with men historically doing most of the grilling in American households, more recent studies have shown an increase in the amount of women who grill. A 2006 study from the Hearth, Patio and Barbecue Association shows that 35% of American women are grilling which was a 6% increase from 2003 (“HPBA Notes Rising Popularity”). Also, a 2007 study showed that 40% of American women were grilling more than they were in previous years. Despite this significant increase in the amount of women who grill, these studies also showed some lingering beliefs from 1950s America, such as 44% of women believe that men would be able to grill in a safer manner (“Women Enjoy Grilling”). Even though the kitchen is still associated with oppression and servitude, many women have become more vocal about not being limited to the kitchen. The kitchen has now become a space in which women may find empowerment and a place of expression of identity (Meah 2014). As gender roles change in society, the roles of gender in grilling in America appear to be shifting as well. The discontinuity between traditional male and female roles inside and out of the house is a large factor in our research project. Our literature review revealed that many of the hypothesized reasons for men being the predominant grillers in American homes dealt with elements of danger and cooking with heat or fire. This reasoning contradicts the traditional role of women being the main cooks of a family inside the home because to cook inside still requires the use of heat and fire. Our study aims to further explore this contradiction and evaluate potential reasons for this divide. The first step of our data collection was a survey we created that we shared with friends and family to obtain quantitative data on the demographics surrounding grilling, including gender and frequency of grill use. The survey’s purpose was to explore grilling practices of our participants, not to generalize conclusions to the American population. Of the 47 responses to the survey, 81 percent identified as female and 19 percent identified as male. Of the 38 responses from females, only 7 noted that they are the predominant griller in their household. Of the 9 responses from males, 6 noted that they were the predominant grillers, whereas 3 noted that they were not the predominant grillers. The responses indicated that 37 of 38 female participants help with other meal preparation and only 1 does not help with other meals. In responses from males, 6 indicated they help with other meal preparation and 3 indicated they did not. Of the women who do not grill, 92% indicated that a male household member (either the husband or father) was the predominant griller and 8% of the responses indicated a female other than herself (mother) was the predominant griller. Participants indicated they most often grilled hot dogs, steaks, chicken, and burgers. Our sample reflected our hypothesis that men are the predominant grillers in America, but we are unable to make a definitive conclusion from such a small sample. Our sample was also skewed to more responses from females than males, so a more thorough study would need to be conducted for more significant results. Using this data, we chose participants who indicated that they would like to participate further in the study for interviews to further explore the reasons behind their answers to the survey. We began our interview process by interviewing two women who were not the predominant grillers in their families, Patty and Tyra. Both women indicated that their husbands were the predominant grillers in their families and that they did most of the other cooking in the household. The reasoning behind the husband grilling for both women was that both husbands loved doing it, and it was a way for the women to have a break from cooking. Family traditions for both women surrounding grilling included having cocktails and making the grilling a family event. Grilling for these women was about having fun with their families while eating good food. Both women indicated that grilling is portrayed as masculine in society, and that women are typically viewed as bystanders in the activity. They both indicated that they thought the act of grilling itself was not something only a man can do and the act itself was not masculine, but society gives the image of that to be true. Patty indicated that she thought this image came from the fact that “men love fire”. Tyra indicated a similar belief when she said the image is rooted in “men’s primal need to hunt for meat and cook that meat over fire”. 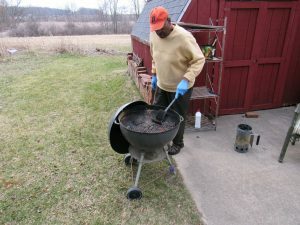 When asked about what was unique to these women’s grilling practices, Tyra indicated that her family grills year round no matter the weather. Patty indicated that her unique grilling practice was “I secretly like to grill and take up any chance that I get”. This quote indicated that although she was a woman who did not grill predominantly for her family, the desire and interest to grill is still present. Next we interviewed Ann, a woman who is the predominant griller in her household. She noted that since she lives alone, she is the predominant griller partly because she enjoys it but also because she is the only person available to do it. She noted that she does not have any family traditions surrounding grilling, although, she enjoys it because there “is less mess in the kitchen”. 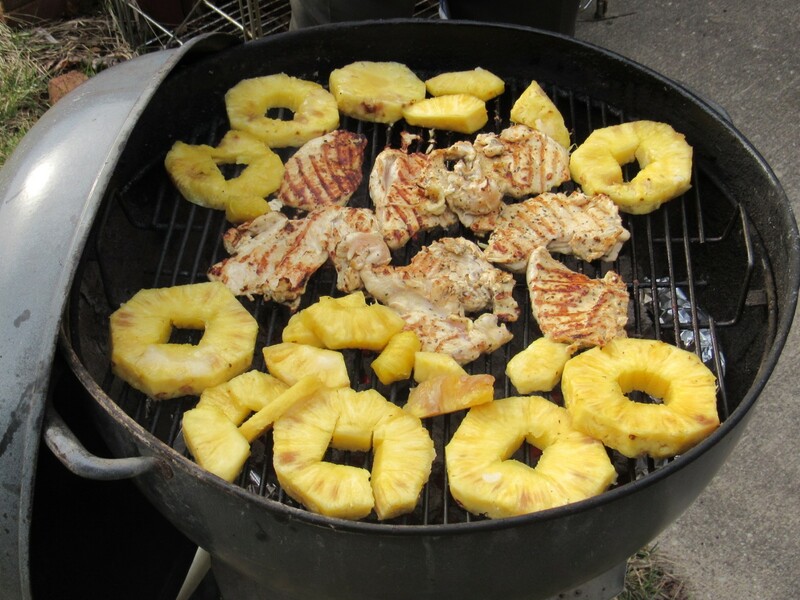 Ann noted that grilling is portrayed as a particularly American way of cooking and usually done during the summer. She sees grills as an essential commodity central to American cooking tools. She said, “frequently its the man” who grills, however, she has always been the predominant griller in her household when her husband was alive and she does not view grilling to be a masculine activity. In her perspective, grilling is portrayed as masculine possibly due to the predominance of men as chefs in the restaurant industry and the danger of interacting with fire. Traits universal to her grilling technique included the basics of preparing the grill, however, her special seasonings, the ways she prepares food, and knowing how to tend to the fire are like an art. Ann taught herself how to grill and is notable in that she is and always has been the predominant griller in her household as a woman. Finally we interviewed Scott, a man who is the predominant griller of his household. Scott first learned how to grill from his own father, supplemented with advice from other men in his family. Scott believes that grilling is perceived as a chiefly masculine activity by society as a whole, but that this is just an effect of tradition, rather than an inherent property of the activity. For him grilling is typically one part of a joint effort, where men prepare the meat and women prepare the rest of the meal, in order to divide the labor of cooking. As far as the traditional masculinity of grilling, Scott said that it probably came from the cavemen days, where men would typically be the ones moving heavy animal carcasses to a fire in order to cook them over it. He believes that many men today could enjoy this perceived connection to their ancestors. Next we used participant observation to explore the grilling practices of a modern American family. The family we chose to observe was the Jackson family, one of the authors’ families. We gathered to observe the practices of this family for a typical grilling social gathering. The meal preparation was done entirely by the father, Robert, while the mother, Shelley, performed other household duties such as cleaning and setting the table. This dynamic aligns with the past tradition of men being the predominant grillers, but differs in that the man is the predominant cook in this household usually. When we arrived, Robert explained that he had already started the coals and prepared the food. We watched him bring the food outside and listened to his methods of cooking and seasoning the food. The dynamic of this family supports our hypothesis that in modern American families, a male household member is often the predominant griller. In media and advertisements grilling is commonly portrayed as a masculine activity. We analyzed commercials and pictures advertising grilling, the oldest being from 1974. In many of the images and commercials men are portrayed as performing active roles such as grilling and preparing the food while women, if they are even in the commercial, are doing passive activities such as talking or setting the table. Of 8 videos that we found, 2 included women in active grilling-related roles. The 1974 commercial perpetuates the trend of men as the predominant grillers by featuring a male at the center of the commercial with women only partly visible socializing in the background. In the modern commercials, men are predominantly portrayed as the grillers. Commercials usually depict grilling occurring during a party with warm weather. Women are most often characters in the background talking to guests at the party or tending to family members. Of our selected videos, the commercials with a voice-over are exclusively narrated by men. In imagery from the past and present, the same trend is seen. The words used in these ads indicate that grilling is portrayed as a masculine activity. The ad pictured above that says “Boy scouts cook on a flame. Man scouts cook on a Napoleon.” does not allow for the possibility that a woman could be a griller. The ad indicates that only a man can cook on a Napoleon grill. Also, the frequent use of the word king when describing a person who grills occurred in our analysis of advertisements. This was shown in the name of the company “Broil King” as well as in the use of the phrase “King of the Patio” in the Camp Chef advertisement in the video below. Through this analysis, we conclude that grilling continues to be portrayed as a man’s job through media. The purpose of this project was to evaluate if gender continues to play a prominent role in grilling today in American society. Our surveyed female population indicated that only 18% of them were the predominant grillers in their family, while the males surveyed indicated that 67% of them were the predominant grillers. These survey results supported our initial hypothesis that men are the predominant grillers in modern America, so we interviewed four individuals who were surveyed to explore the way they perceive grilling in American society and learn about their grilling practices. Our interviewees indicated that the act of grilling itself is not masculine, but society has created this image. Everyone interviewed noted that while the stereotype of masculinity associated with grilling is prevalent in today’s society, they do not personally view grilling as an inherently masculine activity. Our analysis of commercials and advertisements showed a majority of advertisements portrayed men as the active griller while women were either not participants in the act of grilling or were not seen in the commercials, thus reinforcing the stereotype of grilling being masculine. The wording of these advertisements frequently was targeted to males using words such as “king” when describing a person that was grilling, eliminating any representation of women in grilling. We believe that in part the reason for society viewing grilling as masculine could be deeply rooted in the misrepresentation of gender in the media. Through this project, we can conclude that our sample reflects our hypothesis that men continue to be the dominant grillers in American households, but we do not have sufficient data to reach a definitive conclusion that our hypothesis is true. To further evaluate our hypothesis, a more in depth study would be needed. A larger sample to survey as well as a more diverse population to be surveyed would be required to evaluate our hypothesis against the whole population. Duffy, Mignon. “Doing the Dirty Work: Gender, Race, and Reproductive Labor in Historical Perspective.” Gender and Society. Vol. 21, No. 3, 2007, pp. 313-336. Galosich, Allison. “Grilling in America.” National Provisioner.Vol. 214, No. 9, 2000, pp. 16. “HPBA Notes Rising Popularity of Grilling Among Women.” Casual Living. Vol. 46, No. 3, 2006, pp. 44. Meah, Angela. “Reconceptualizing power and gendered subjectivities in domestic cooking spaces.” Progress in Human Geography. Vol. 38, No. 5, 2014, pp. 671-690. Miller, Tim. 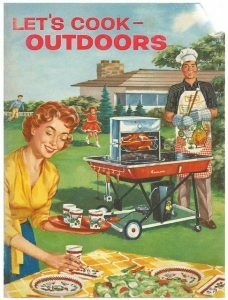 “The Birth of the Patio Daddy-O: Outdoor Grilling in Postwar America.” Journal of American Culture. Vol. 33, No. 1, 2010, pp. 5-11. Neuhaus, Jessamyn. “The Way to a Man’s Heart: Gender Roles, Domestic Ideology, and Cookbooks in the 1950s.” Journal of Social History. Vol. 32, No. 3, 1999, pp. 529-555. Sobal, Jeffery. “Men, Meat, and Marriage: Models of Masculinity.” Food and Foodways. Vol. 13, No. 1-2, 2005, pp. 135-158. “Women enjoy grilling, but admit qualms about safety.” LP/Gas, June 2007, p. 30. General OneFile, http://link.galegroup.com/apps/doc/A166050254/ITOF?u=msu_main&sid=ITOF&xid=c7d79f47. Accessed 14 Feb. 2018.